In this episode, we’re joined by Katy Stevens from N7 Cafe and Trish Cummings from Forage, both are based out of Eau Claire, Wisconsin. N7 is primarily a mobile based coffee company and Forage is a shared kitchen space where small business owners can rent space to produce their goods. Brendan: Hey there. You’re listening to the Drips and Draughts Podcast. Today, we’ve got part one of a three-part series where we talk about cold brewing and shared kitchen spaces. Maybe I shouldn’t say just shared kitchen spaces but shared spaces in general. On today’s episode, we’re joined by Katy Stevens from N7 Cafe in Eau Claire, Wisconsin. Katy rents space from Trish Cummins, the owner of Forage. Forage is a shared kitchen space and a culinary incubator and really just sounds like a cool place to operate out of. Katy had joined us on episode 30 back in October of 2016. She came on to talk about Pumpkin spice nitro coffee. She’d be a good person to reach out to if you’re thinking about doing nitro coffee and especially if you’re thinking about adding any flavoring to it. Make sure you check her out on social media. Her handle is n7cafe. Before we get into today’s episode, got another review to read here. This one was left on iTunes by Jim Schultz and the title is “Continuing my home brew adventures”. The review says, ” This podcast was the answer to so many of my questions about cold brew coffee and nitro cold brew. 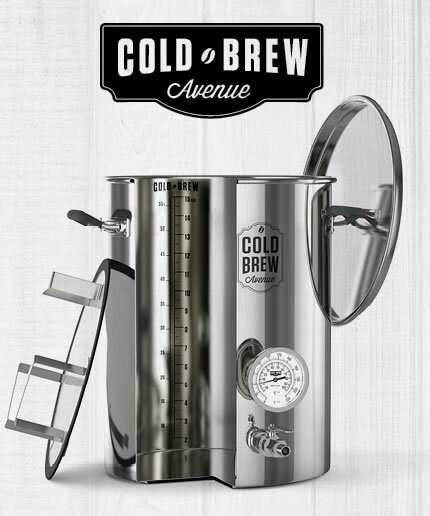 I am a novice home brewer and have become very interested in the new flavors that cold brew coffee has to offer. Thank you for continuing to be a great source of knowledge and inspiration. Brew on”. Jim, thanks for taking the time to leave us a review. We appreciate it and for anyone else out there who hasn’t left us a review yet, take a couple minutes. Hop on to iTunes, click to rate us, click to review us. Hey, we might read it on the show and you or your business might get a little shout out. One other thing to briefly mention before we get into today’s episode, we’re quickly coming up on our one-year anniversary episode. On that episode, we are going to announce the winner of one of our all-in-one countertop Nitro coffee Kegerator fridges. If you’ve got any interest in winning one of those units, go to dripsanddraughts.com/giveaway. That will redirect you to the product page on Keg Outlet. Scroll to the bottom of that page and you can enter your name and email address and you’ll be entered to win. It’s really that simple. We’ll randomly select a name live on episode 52 and we’ll be giving this bad boy away. Again, if you’re interested in winning this all in one Nitro coffee countertop fridge, you can enter to win at dripsanddraughts.com/giveaway. If you’re looking for links or show notes from this episode, you can find those by going to dripsanddraughts.com/49. Let’s get into today’s show with Katy Stevens from N7 Cafe and Trish Cummins from Forage. If you are looking to learn more about cold brew or draft coffee, make sure you check out Keg Outlet’s Ultimate Guide to Cold Brewed Coffee and Serving Coffee on Draft. But hey, don’t just take my word for it. Here’s Daniel Browning from the Browning Beverage Company in Marfa, Texas. Daniel Browning: I got on the internet and started looking around and I found Keg Outlet’s Ultimate Guide to Cold Brewed Coffee and read it a couple more times than I’ve read anything in my life. That was pretty much all the research that I needed. Brendan: If you’re looking to start your journey with cold brew or draft coffee check out The Ultimate Guide to Cold Brewed Coffee and Serving Coffee on Draft. A free 34-page eBook offered at kegoutlet.com. You can get there through the Drips and Draughts website by going to dripsanddraughts.com/ultimateguide. All right, welcome back to the Drips and Draughts Podcast. Brendan and Cary in studio today. We’re joined by Katy from N7 Cafe and Trish Cummins from the Forage Cafe. How are you guys? Katy Stevens: We’re good. Thanks for having us. We’re excited to be here today. Brendan: I didn’t butcher anything yet. Did I? Last year I said you were from Eau Claire, Washington which is actually Eau Claire, Wisconsin. Trish Cummins: Well. Forage is just Forage. Trish Cummins: Yes. Sometimes it’s a cafe but sometimes it’s a yoga studio, so we just call it Forage. Brendan: Yes. It wouldn’t be a podcast if I didn’t butcher something. Katy, you were on episode 30 with us back in the end of October. Would you mind giving just a quick background on yourself for people who might not have listened to that? Katy Stevens: Yes, sure. I started up a business called N7 Cafe and that was almost a year ago, in February it will be a year. We are a mobile cafe. We go to special events and farmers markets and sometimes do pop up cafes. We focus on cold brew coffee and nitro coffee. Pretty simple, just two products and we do some bottling and I also jar in mason jars a concentrated version of the cold brew. Katy: That’s about it in a nutshell. Brendan: Cool. How about you Trish. Can you give us a little synopsis on Forage and your background? Katy: A little synopsis of course. Trish: A little synopsis of [unintelligible 00:06:18] . Trish: I am a transplant to Eau Clair. One of the things that we have loved about living here is we have access to amazing fresh produce and great locally raised organic meat. We have wonderful farmers. But we weren’t seeing the farmers products in our restaurants or even in our co-op and definitely not in our other grocery stores. I planned this business concept back in 2013 and opened in January of 2014 a culinary incubator. I honestly didn’t know what I was opening when I started. I knew I wanted a place where people could produce locally. Where we could have farmer education events specifically targeting food scarcity and also the economic impact of local food systems. When I started to research what I wanted to do, that’s when I came across the term culinary incubator and started to research what was going on across the country. Luckily found a synopsis or snapshot that was done in either 2013 or 2012 and it talked about what was going on across the country in kitchen incubators, shared kitchens, culinary incubators. I was able to online connect with different organizations across the country. Eau Claire wasn’t really and maybe still isn’t big enough to just have a shared kitchen in the way that I wanted to do it. Our tagline is “Create, educate and celebrate.” In addition to a shared kitchen where people can do wholesale or retail food production, we also offer cooking classes. We rent the space out for special events with a focus on local food and big picture food issues. Trish: We expanded in 2015 and now we have a full restaurant license and a beer and wine license. We can operate as a restaurant. We only do that on occasionally, maybe once or twice. It was once or twice a month. We now have a chef in residence that just started. We will be doing at least two or three pop-up type restaurant offerings each week. Brendan: Cool. I know when I started talking about this episode with Katy, I talked to a few other people as well. The idea came from somebody who suggested the shared kitchen episode where I know there’s another client we have that was renting out actual restaurant space, just their kitchen. They were using it in off hours. The fact that you have a full kitchen space that’s available, it’s definitely something I think could be very useful. Especially in big cities where rent is just off the chain. Can you tell us what type of businesses are using the shared kitchen? Trish: We’ve had quite a variety in the three years that we’ve been open. We’ve had people who are producing specifically for farmers markets. We’ve had a hummus producer, a pickle producer. We’ve had a couple of bakers, we’ve got Katy. We have a wonderful chocolate maker who does beautiful handcrafted truffles. We have caterers who use our space if they are going to cater events off site, now that we have the restaurant license. Who also we had in here? Katy: It’s definitely a benefit for me when I come in to make my coffee. Especially if the person who is making the chocolates was just here. She has some mistakes and I’m like, “Sure, I’ll take those”. Brendan: I’ll test those out for you. Katy: Somebody was in here making some test recipes and I got to sample some of them and they were amazing. That’s one benefit of being in a shared space is that you can meet these other businesses that are doing such great things and try out their foods and work together a little bit. Cary: That’s cool. We can collaborate with other professionals in different industries and stuff. It’s awesome. Brendan: Yes, I got to imagine. Collaboration is something that you see a lot of in there. Trish: We have quite a bit of collaboration, but we also have plans for additional collaboration in some of the bigger cities, kitchen incubators, maybe move into shared marketing, shared distribution. That is an issue here. Each producer has to go out and knock on doors and try to get their product into the markets or into the grocery store. And it would be great to get to the point where we can actually share that collaboratively. Brendan: Yes. Kind of represents some of the people who want to get into the markets. Trish: I don’t know if Katy told you on the last podcast, but we are located in a large old tire factory that’s been converted into artist space. And so we’re the only food establishment in the building. But we’re on the third floor of an old building filled with artists of all different types and antique shops. It’s a great space to be because there’s already that creative energy going. Every year they open up for two days and do a big art crawl and so we get exposure. Brendan: In your kitchen, people are renting time. Is it basically, I come in, I rent the entire kitchen or is it subdivided? Does that vary depending on who’s in there? Trish: It does. At this point, it’s mostly that you rent the entire space. We do have doors dividing the kitchen from the event space and so ideally we will get to the point where we can. Depending on who’s producing, if it’s someone like Katy who is collaborative. Not that we don’t have– We don’t have any un-collaborative people, but we have people who produce that need more space or need to move out to the dining room or who are literally using every surface area in the kitchen. At this point, we’re still able to keep everybody and I’ve just signed on a google calendar. We have a lot of time available, seven days of the week, so most people are able to find what they need and we just schedule accordingly. Cary: Are most people in there just for like a few hours or a whole day or what’s your typical rental? Trish: It depends. Some people it’s a few hours. Some people get something started and then come back. The chocolate lady really needs a nice 10-hour block just for how long it takes for everything to set. It’s really a combination and then we have a great relationship with each other where maybe you are setting up for a half hour while the other person’s cleaning up. And there’s some chance to talk them, but also share the space for a little bit. Brendan: Nice and then how about somebody like Katy, a cold Brewer, who’s not necessarily going to need to be there the whole time. But her equipment will probably have to be there for 24 hours. Right, Katy? Brendan: Yes. As with the brewing beer cleanings, probably 90% of it. The brewing process is a very short amount of time. Katie: Yes, and the main things that I use in the commercial kitchen space here at Forage is the three compartment sink which is great for cleaning. And then also, they have a water filtration system and I use that there that– filters a lot of really good to make the nice fresh clean coffee. Brendan: Nice. I have to imagine that’s going to be something that most cold brewers, anybody making coffee is going to be looking for if they’re looking for a shared kitchen space or any kitchen space to rent or use. Katy: The water. Yes. The water is most of the ingredients that go into a cold brew coffee. It’s just coffee and water, so the water has got to be good. It’s got to come from a good source. Brendan: Yes. If you wouldn’t drink the water, I can’t imagine you’d want to put it into your coffee. Brendan: Can you guys talk to us a little bit about maybe some of the benefits of a shared kitchen at over trying to maybe get your own space. Whether it be a small or a large space. Why would somebody want to get a shared kitchen or rent space in a shared kitchen? Trish: How we promote ourselves and what I hope we’ve been able to offer to our clients is a very easy way to get started. Everything is so hit or miss. It’s pretty scary to get started in the food business. We’re in a very affordable building and so then we can turn around and make our hourly rents very affordable. Our customers can come in the door and literally have just about anything they would need. We’re trying to have everything that someone would need. If you need a specific piece of equipment for your particular production item, then we asked people to get that themselves. But we have, like Katy said, we’ve got all the sink setup. We’ve got plenty of stainless steel tables and prop spaces. We’ve got commercial refrigeration, commercial ovens, commercial cooktops, all the pots and pans, and spoons and knives, linen service, cleaning service. In addition to holding the license with our city county to be a restaurant and then we also qualify under the State Department of Agriculture. When people get license that way, so we try to have everything they could need, commercial dishwasher. And then, they can just literally start day one and go full into production. Cary: That’s crazy. If someone new coming in, all they need is just their general business license or resale license. And they just say, “We’re making our food at your shop and you provide all the food licensing”. Is that really all that’s done? Trish: It depends, if they are going to go out and wholesale at somewhere else, they’ll actually get licensed on their own through the state of Wisconsin. But if they are going out, for instance, we are going to try to have a presence at some of the local. We have a great summer here. Not a great winter but a great summer and we have fabulous music festivals. And so Forage can through our license go out and be a presence at these, and then all of the people who produce at Forage can fall under our umbrella. Literally an umbrella tent, they’ll be able to sell their product at these different festivals or local picnics and festivals that we have down the street, so we provide that as well. Or we can also just go together on pop-up event, so they get a lot more exposure by being in a shared kitchen than if they were just a stand alone. Brendan: I know. I’m just making guesses in my head as to what it might be. Brendan: But I probably don’t want to hear it. Katy: Yes. Great exposure with being in Forage. A lot of people in Eau Claire they might not necessarily have heard of Forage. But when they hear about what it is, they’re super interested, and they want to come here and check it out. That’s all I can think of as far as that goes. Brendan: Okay, how’s scheduling currently work? Is that something where you guys have a public calendar and if there’s an open space I could just sign up and say, “I need the kitchen for three hours”? Trish: At this point, I still have everyone email me what their needs are and then plug it in. But we might get to the point where all the vendors or excuse me customers can actually see the calendar and then we still need to plug people in. We have people who use it every week. We have people who use it once a month and we have people who show up once or twice a year, so trying to balance that. We’ve recently changed our pricing structure to reflect that so that people who are here and committing to the space every week will have a different rate. They’ll have access to different services. We’ll be able to maybe self-schedule. Trish: Yes and honestly it’s constantly a work in progress. We are always tweaking how we’re doing things. What’s working for people? What isn’t? What services do we need to add? What did we think was important, but maybe not so much. Down the road, we’re hoping to add some micro-loans because we have people who want to get started. Depending on what they’re making, some of that startup costs even after they have access to a shared kitchen is high. And so, we’d love to be able to provide some micro-loans to producers. Brendan: That be great and I got to imagine that would bring a lot more clientele and through the doors as well. Trish: I think so. Especially, for some of our pop-up events. Food is so big everywhere that we’ve got people who think, “Oh, they want to start a restaurant,” well how about you come and pop up a few nights at Forage and see if you really like that work before you go to get a business loan. It’s a nice pretty risk-free way to get started. Brendan: Absolutely. And then one more question regards to scheduling. I know I spoke with somebody who’s using a restaurant space to do some cold brewing, he was doing it basically after the restaurant closed. He had a key to their facility he would go into one of the kitchen afterwards and start a batch, and then come back the next next morning and drain it while they were all in there getting the restaurant ready for the day. How’s your scheduling work in terms of hours. Are you guys, nine to five or do people have access to come in there from midnight until six AM if they wanted to? Trish: We are 24/7 like I said we’re in this big artist building and so there are people here that are drawing class or painting all night long. And so we have security and if you need to get out to your car and get back in it’s not a problem but we are available 24 seven. At this point we haven’t really had anyone who produced over night but we definitely have that option. We did have one baker, she since moved out of the area but she was working out of a restaurant and the reason she switched over to us is just access, that we’re not open every night and that we can be a lot more flexible with our hours. Also, she said that it was a clean restaurant but there’s just this restaurant smell especially if there are fryers and things, and she felt that she could sense it or taste it in some of her products, that heavy grease feeling. Because we are an old building we don’t do any frying we actually aren’t licensed to do anything like that so our space stays pretty clean, pretty pristine. We use our kitchen as a classroom also so it needs to always look a certain way. And so she found that we were a better fit for her than the restaurant she had been working at. Cary: You have a full day ahead of you afterwards. Katy: Yes or if somebody has an order at the last minute I can come in at 10 o’clock at night and put something together, so it’s very flexible. Brendan: Absolutely. And then Katie you mentioned you have storage across the way, is that after you’re done brewing, and after you maybe bottle, or can or take care of your cold brew, do you keep it in the storage or are you taking it off site at that point? Katie: I keep it in the commercial fridge here right across the hallway until I am ready to deliver it. Brendan: Nice. That sounds like a great set up. I have to imagine that if there were spaces like that in every city that they do pretty well I think. Katy: I feel really lucky that I connected with Trish, and that I am able to use this space. I just feel like I have a new group of friends and supporters and it’s just great starting out with a new business to have that behind you. Brendan: One other thing we had noted on here was waste disposal. Obviously cold brewing coffee results in a lot of coffee grounds that are spent and used already. What are you guys doing as far as waste disposal either you Katy or maybe Forage as a whole? Katy: Well, for me so far I have just been using the grounds for my own personal compost in garden. But that won’t do for much longer because as I grow I’m going to have more and more coffee grounds, and I don’t know how much my little garden can handle. Trish: Yes, we are making a switch. We are lucky now about a year ago a couple started out earth bound environmental and so they– in Eau Clair, the city doesn’t contract with one trash hauler, everybody just picks, I don’t know, maybe there’s four or five right now. But there’s a new one that has started and they will take compost and so we have plans to just have a shared compost here at Forage and have it hauled by this new earth bound environmental solutions. Brendan: Yes, that is nice. Katy: Do you guys out there have companies like that that will take your compost, food scraps and things and turn them into compost? Brendan: Not that I’m aware of. Brendan: He feeds his goats or something. Brendan: I’ve heard of a few people getting small backyard composting pits that do it themselves but I’m not familiar with anybody that does a pick up service, I think that can be huge in the LA area. Trish: We also have plans issue, we have quite a few community supported agriculture farms out here, subscription based farms, and so we are looking at becoming a dropping off point for the different CSA’s, and so there might be some trading of compost ready scraps for fresh vegetables so that’s in the works also. Brendan: Nice. Cool. I think that pretty much answers all of our questions, is there anything that either of you want to add Katy or Trish? Katie: No. Let me look at my notes, I think we covered everything. Brendan: If not we’ll have to find out when you guys are doing one of these music festivals we’ve got family in Wisconsin so we might have to come visit. Cary: Great to show up. Trish: Absolutely. Well we have a wonderful music festival, Eau Clair Fest, if you’ve heard of it, this will be the third year. Have you heard of a little group from here called Bonnie Bear? Brendan: Bonnie Bear, no. I don’t think so. Trish: Well look it up. Trish: Making things happen. We also, because you guys are brewers too, I mean, you brew beers too, right? Trish: We have, what do we have now? I can look up the window and see two local brewers here. Cary: Yes, we’re very familiar with that. Brendan: Our parents were in Wisconsin over around Christmas time they brought some lainies back. That was good. Brendan: I was going to say where can people go to find you guys if they’re interested to learn more? Trish: We have a website ForageEauClair all together, and we’re also on Facebook and Instagram as ForageEauClair. Brendan: Awesome. And Katie you care to throw your info out there again? Katie: Of course, I’ve got a website, n7cafe.com, and then also on Facebook and Instagram and Twitter. Trying to get all out there. Brendan: Nice. All right and we’ll definitely put all those in the show notes so people can click and learn more about you guys. Katy: Great thank you so much for having us, it was super fun. Brendan: Thanks for joining us today, Cary just had to run and grab the door, but I’m sure he says goodbye, but thanks again and maybe we’ll have you guys on in the future. Cary: Are you looking to get started with serving your favorite craft beverage on draught? Kegoutlet.com has you covered for all of your draft beverage needs. From complete Kegerators to individual parts for upgrades and replacements, kegoutlet will help get you pouring your craft beverage on draught. To learn more visit kegoutlet.com. Brendan: Another thank you to Katy Stevens from n7cafe, and Trish Cummins from Forage for joining us today on what was the first episode of our three part series for cold brewing and shared spaces. Part two of the series will air on episode 51 where we talk with Matt Bishop from Cafe Mule, Matt takes us along on his journey from cold brewing in a doughnut shop, to cold brewing in a brewery. Then for part 3 of the series, which airs on episode 53, we’ll be joined by Jason Gershowitz from Coffee Counselor. Before we wrap up today just a reminder, our one year anniversary episode is coming up quickly, that will be episode 52 which airs on March 31st. We’re looking for ideas for the show, so if you’ve got anything you’d like us to discuss, to do, to talk about, let us know. Find us on social media under the handle drips-draughts or call in. Our phone number is 888-620-2739 extension six. That’s 888-620-2739 extension six. All right that will do it for today’s episode, thanks to Katy, Trish and Cary, I’m Brendan Hanson. And we’ll see you again next Friday on the Drips & Draughts.